Alma (the highest town in Colorado), Fairplay, and the fictional town of South Park are in Park county. Anthem BCBS is the only option available for residents of Park county to purchase. Anthem BCBS has 5 unique providers in Park County. Anthem BCBS has 0 unique facilities in Park County. Anthem BCBS has 5 total unique providers + facilities in Park County. Bright has 4 unique providers in Park County. Bright has 1 unique facilities in Park County. Bright has 5 total unique providers + facilities in Park County. Cigna has 1 unique providers in Park County. Cigna has 2 unique facilities in Park County. Cigna has 3 total unique providers + facilities in Park County. Colorado Choice has 0 unique providers in Park County. Colorado Choice has 0 unique facilities in Park County. Colorado Choice has 0 total unique providers + facilities in Park County. Denver Health has 0 unique providers in Park County. Denver Health has 0 unique facilities in Park County. 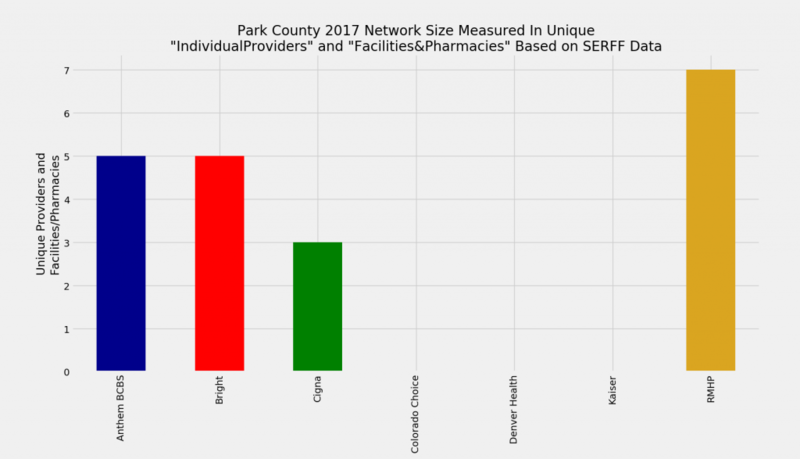 Denver Health has 0 total unique providers + facilities in Park County. Kaiser has 0 unique providers in Park County. Kaiser has 0 unique facilities in Park County. Kaiser has 0 total unique providers + facilities in Park County. RMHP has 6 unique providers in Park County. RMHP has 1 unique facilities in Park County. RMHP has 7 total unique providers + facilities in Park County.